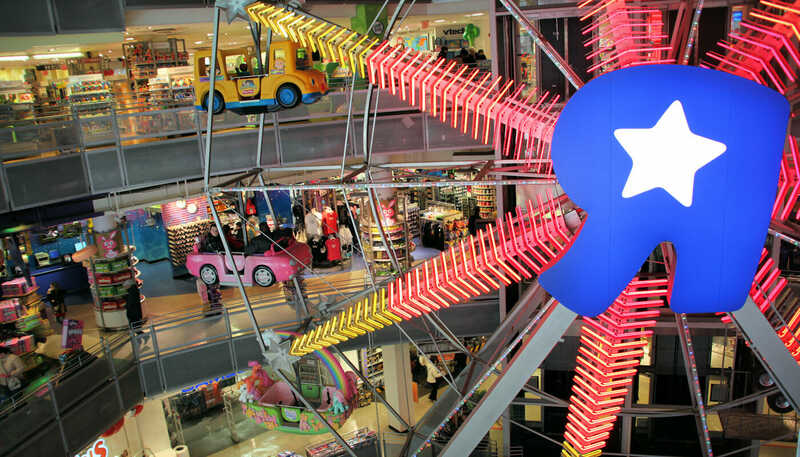 Toys”R”Us on Times Square New York is not your average toy store. Actually, it’s anything but your average toy store. You probably know Toys”R”Us as the place your children drag you to, while you hide your wallet. In New York, however, the tables are turned and you yourself will feel like a kid again in ‘The World’s Greatest Toy Store’. Whether you prefer Barbie dolls, action figures, games or candy – in this 10,220 square meter playful paradise there is something for everybody. And in the rare case that there’s not, you can always just sit and wait for the rest in the iconic in-store 18-meter tall ferris wheel; stare in awe at the 6-meter tall animatronic, roaring T-Rex; or walk through the real life Barbie Dollhouse. Indeed, this is not just ‘The World’s Greatest Toy Store’, it’s also very much a playground, for young and old. Toys”R”Us is a huge store and as such, the names of the departments speak for themselves: Action Figures & More, Barbie Dollhouse, Electronics & Music, Games, Imaginarium (quality toys with a high learning value), LEGO Shop, Plush Pets, ROBOTGALAXY (where you can build your own robot! ), Video Games & Movies and Wheels. I have only one thing to add: these departments are all you expect them to be, and more. It’s more about the experience than the actual toys, although you can of course buy those as well. Baby on the way or in the stroller? Then make sure to stop by Babies”R”Us. Are the kids a bit older? Then take them to collect stones and watch experts crack rocks at Astro Kids; let their inner fashionista flourish at clothing department LittleMissMatched; or get them glammed up at the Fashion Angels counter, where they can put together their own jewelry. And don’t forget to treat the taste buds at Candy Land, Cookie Party, Scoops”R”Us or WONKA. Toys “R” Us Times Square location has closed. If you want to read more about what to do with children in New York, then read my tips here.